I didn’t want to do it. I seriously didn’t want to go through with it. But there was no way back, and it was the only way I could go forward. I had to move. I was holding everyone else up. “It’s ok, you can do it.” One of the women in the group shouted, not unkindly. I took in a deep breath, watched my breath fog up as I exhaled loudly. It was so cold deep in the cave. I looked down at the dark abyss in front of me. The water was still. I wouldn’t even have known there was a pool there, if the stalactites hadn’t been reflected on its glassy surface. 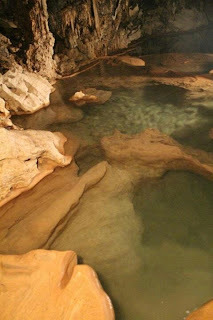 The water was surrounded by jagged shards of stalagmites. The only way across was a makeshift, well, I can’t even call it a bridge. 2 pieces of rope, each only an inch thick. One to step on to and shuffle sideways on, the other to hold on to. I looked at the others. They’d made it across, no fuss. Even the largest person in the group made it. They were all waiting for me. The guide behind me kept scratching his head impatiently. I tested the rope with my foot. It bounced with my weight. Holy hell. I closed my eyes and held on to the higher rope. I inhaled, and finally let my other foot leave the stone I was standing on. I held the rope in my hands with a death grip as the rope under my feet slackened and bounced. I was finally on it. All I had to do was shuffle across the ten feet or so, with jagged rocks and still, cold water underneath me. I tried to stop myself from thinking what could be inside the water. One shuffle. Then another. Each shuffle seemed wobblier than the next. I could vaguely hear everyone else cheering me on, as I kept my eyes focused on the rough stone wall in front of me. One more shuffle. And another. You’re almost there. Three more shuffles to go. I didn’t even feel the fall. I had blinked, and the next moment I was engulfed in freezing cold water. I opened my eyes and I could not tell which way I had fallen. It was pitch dark, and my heart froze at the thought of spineless creatures possibly swimming around me, ready to drag me down. I couldn’t tell up from down. I might as well have my eyes closed. Then all of a sudden, a moment of clarity. As soon as I felt myself floating upwards, I kicked and swam for all I was worth. I heard cries of panic and felt a hand pulling at my arm as soon as I broke the surface. I was told later on that my head had missed a protruding rock by centimetres, and the pool was roughly a hundred feet deep. I was 15 years old, and it was the second time I had nearly died. Sept. 5 Blogtember topic: A story about a time you were very afraid. OMG I want to hear more! You're an amazing writer. But what a terrifying experience! I'm glad you're okay. Aww thanks Samantha! 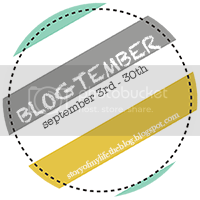 Right back at you, I really liked reading your Blogtember post.